When working with a group of global executives from a wide variety of companies the other day, the conversation turned to their executive team meetings. Specifically, they were talking about their weekly executive team meetings being a waste of time. 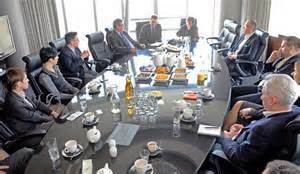 Any executive knows it’s important to get their team together for regular meetings. The problem is that, like many of the meetings we’ve all attended, what is happening in those meetings is a poor use of that precious time together. If we want things to change, we have to change how we spend our time. See if this sounds familiar. The team holds a 2-3 hour meeting every week. The vast majority of the time — 70%, 80%, maybe 90% — is spent focusing on status updates about what has already happened and on operational data that could just as easily be posted and read in a report. Often, many people have already heard the information in other meetings and this is being done for the CEO, VP or whomever the senior person in the room is. Or, the meeting is a mix of agenda items that were pulled together when the executive assistant sent out the weekly request for topics for the meeting. The topics are often pet projects someone wants to share or something the individual wants ‘some input on’. Any discussion or problem-solving is focused on narrowly focused issues that may have short-term impact but in the grand scheme of things, really did not need everyone in the room’s input or perspective. A couple of people could have talked about it and made the decision what to do. The resulting decision could then be communicated to the larger group, if necessary. Invariably, the agenda doesn’t get fully covered because the team ends up in a deep debate about one of the topics or gets into a drawn out discussion about implementation details that are best left to those whose job it is to implement. How can we get out of this meeting hell and use this very expensive time for effectively? 1. Focus on strategy. Establish separate meetings to deal with operational issues. Otherwise, operational issues will always dominate the meeting. 2. Focus on decisions not discussion. Any discussion should lead to a decision. Background information that is needed for the decision should be sent and read before the meeting. 3. Prioritize based on value and importance not just urgency. Sometimes an urgent issue needs to be addressed. If everything is on the agenda because of urgency, you’ve got a problem. 5. Ask, ‘why should we be talking about this?’ about any topic that creeps onto the agenda. If it’s purely information sharing, write a report or create a dashboard. If it’s a decision better made elsewhere, get it off your agenda. For tips from Fast Company on how to stay productive during days of endless meetings, click here. This Could Actually be a Valuable Meeting Who’s Working 40 Hours?